There’s a time to shop and there are times to dream. For many, including myself, the latter applies when it comes to this recent release from Audio Research. 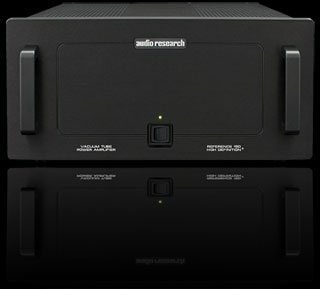 Audio Research, a company well known and regarded for its tube hybrid audio components, has just recently release their new Reference 150 stereo amplifier (REF150). The REF150 replaces the REF110. The REF150 is claimed to offer more power, greater dynamic thrust, a more vivid and resolved presentation, greater finesse, and quieter operation then its predecessor and is their new benchmark. Cosmetics, carryover with the styling cues that Audio Research components are known for but includes the updated looks of current-generation models, with silver units having silver handles and silver top covers, while black units have black handles and black cover. That said, clients can request mix matched colours to match their other Audio Research components. The REF150 is a fully-balanced design, so its inputs are balanced XLR only. It has a 20-amp IEC power connector, 4-8-16 ohm output taps and 12V triggers arrayed on the rear panel. 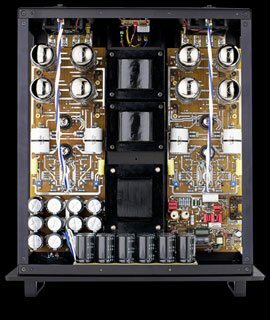 Power-supply capacity has been increased and the output stage coupling is a combination of “ultralinear” and Audio Research’s patented “partially cathode-coupled” topology, which is superior to conventional pentode or triode operation. Power output is rated at 150 WPC into 4-, 8- or 16-ohm speaker loads. Each channel is fan-cooled with new extra quiet fans and low-turbulence intakes. Internally a small LCD display indicates tube hours. The REF150 is currently available at an MSRP of $12,995 U.S.